Neal Cortell, Executive Producer-Director, Writer, Lecturer, Author, and Historian - has an extensive career involved in diverse aspects of television journalism. 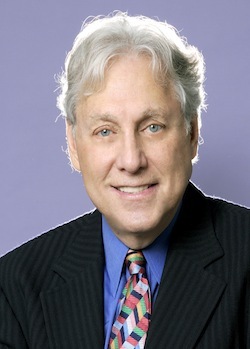 He has developed ABC Money Talks, ABC MoneyScope, American Consumer, and Business Week TV brands, under which he produced and directed 400 national financial news programs and 3,000 daily business reports that became the number one-rated of their genre. News programming alone under his charge has run in excess of over thirty-years via: ABC-TV, PBS-TV, FOX Business Network, and WorldNet TV. Neal Cortell’s professional background includes Reuters, Bloomberg, Wall Street Journal/Dow Jones, Monitor, and ABC News. Neal is member of the American Society of Professional Journalists, U. S. Department of State Foreign Journalists Program, former consultant to American Forces Network, Europe (AFN), Deadline Club, National Arts Club, graduate of Emerson College in Boston, DeCordova Design School in Lincoln, MA, and former Journalist in the United States Coast Guard (Ret). 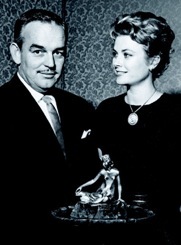 By creating the Monte-Carlo Television/Film Festival in 1961, Prince Rainier III and Princess Grace of Monaco wished to "encourage a new art form, in the service of peace and understanding". Monaco's global status suited the ambition of the Royal Family: to recognize television and film as a means of bringing cultures together and enhancing their respective knowledge. This project immediately generated worldwide interest and over the years, many recognized celebrities have sat on the successive juries, bringing international recognition to what can be considered the best of television and motion picture programming. H.S.H. Prince Albert II of Monaco has been the Honorary President of the Festival since 1988. 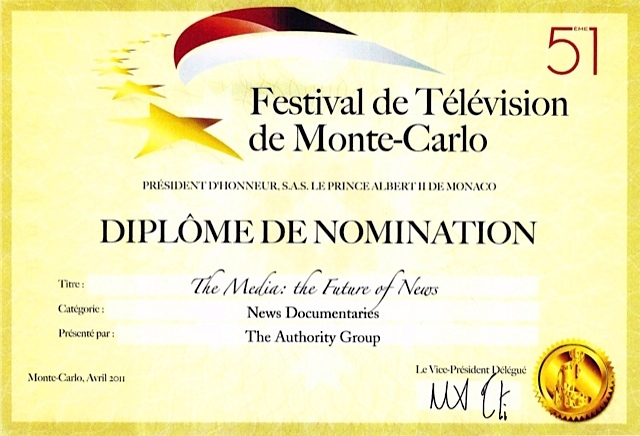 The Authority Group of New York was honored as a "Select Finalist" in the News Documentary category entitled, THE MEDIA, Future of News by the international jury in Monaco. Phil Donahue, TV Talk Host & Film Producer, "Body of War"
Cokie Roberts, ABC & NPR Analyst, author of "Founding Mothers"
Andrew Kohut, Pew Research Center, D.C.
Naomi Klein, Lecturer & Author, "The Shock Doctrine"
John Quelch, Harvard Professor & Co-Author of "Greater Good"
Ellen Hume, MIT Civic Media & Authored, "Tabloids, Talk Radio and Future of News"
David Sirota, MNNBC Commentator & Author, "The Uprising"
Michael Wolff, Author & Media Commentator of "Vanity Fair"
Malia Lazu, Gathering Project, co-author "Get Stupid White Men Out of Office."